My husband worked hard this summer preparing a great hunting spot for me. Unfortunately, I had foot surgery day before black powder opened. I said 'a good husband would help me get to my stand so I can still enjoy opening day.' 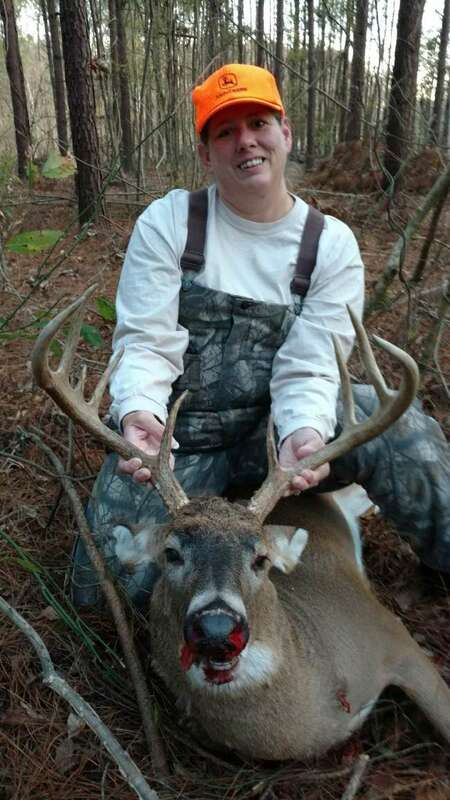 He laughed and said 'a good husband might, but your husband's going to go sit in your stand and shoot that big buck for ya'. He was in love with a nice 9 point on our trail cam. Sure enough, he hunted my stand two weeks while I recouperated. Ironically, Hubby missed The Big 9 two Saturdays in a row. Hubby threw a fit after the second time and cleared out, knowing the good Lord had another idea about who was taking that deer. I was able to get back to my stand on Nov 11th, and as I approached it for my afternoon hunt, I found big boy already waiting for me there. I quietly slid in my ground blind and settled down for a nice broadside shot. Within five minutes, I was able to harvest the biggest buck of my life!